That being said, this is a tiny fraction better than ‘Batman v Superman: Dawn of Justice‘, but again, that’s not saying much either. I still think one of the worst films in the comic book realm was the recent ‘Fantastic Four’ remake. That movie on a whole was just terrible on every possible level. It was the worst movie of the year for me. Nothing worked on that film. 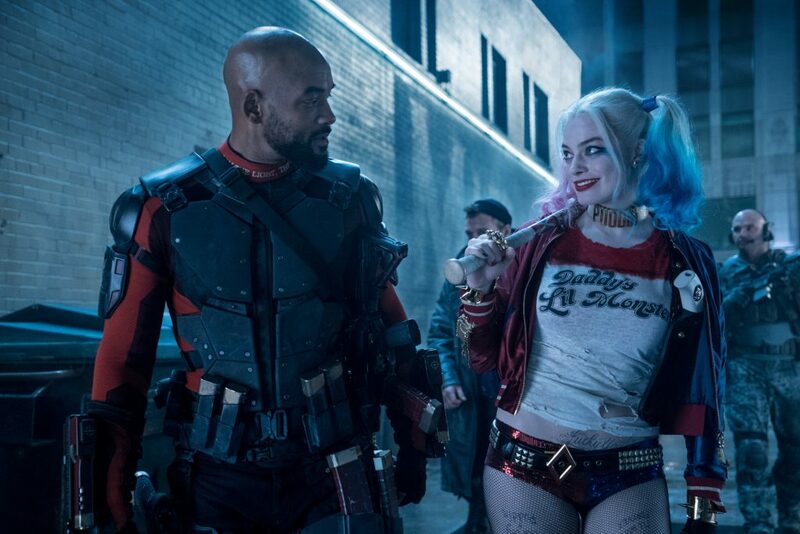 Here with ‘Suicide Squad‘, Ayer and Warner Bros. had all of the perfect parts to make a great movie, but somewhere in post-production, everything was lost, which makes me just more disappointed in ‘Suicide Squad‘, because they had a ton going for it, but missed the mark, seemingly on purpose. This concept is nothing new with having a team of “bad guys” unite to fight something worse for the greater good. Akira Kurosawa’s ‘Seven Samurai‘ paved the way for this genre, which in turn gave birth to this sub genre that spawned ‘The Magnificent Seven‘ all the way to Marvel’s ‘Guardians of the Galaxy‘. 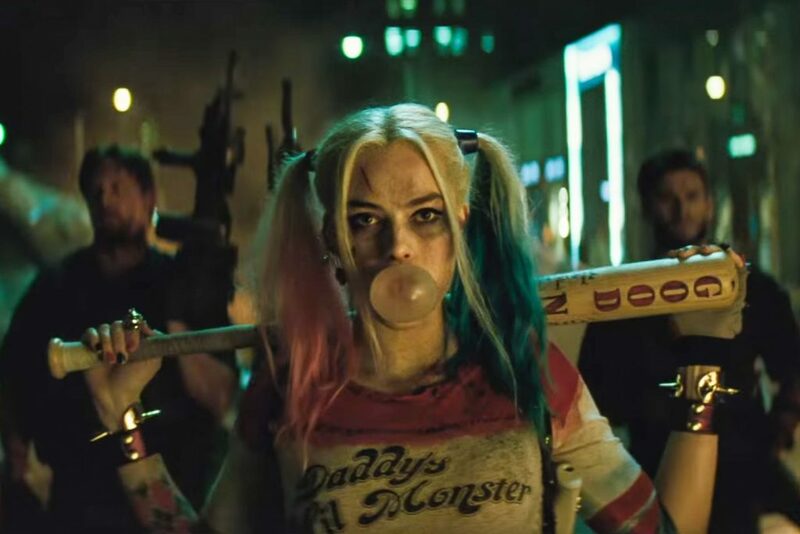 Those films worked on every level of entertainment and filmmaking, where ‘Suicide Squad‘ falls short on almost every account, whether it be the horrendous and cringe worthy dialogue throughout the whole movie, the unbelievably awful plot and relationships that are just flat out silly, to the vast amount of characters who never get any screen time other than a couple of shots of action. It was all a disappointment. 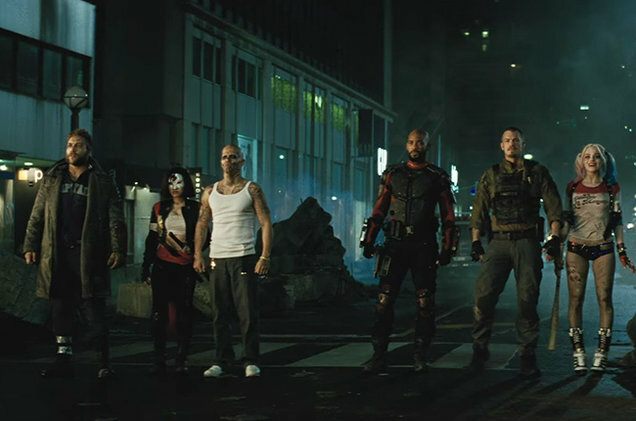 Since most people won’t know who or what the ‘Suicide Squad’ is other than big comic book fans with the exception of The Joker (Jared Leto) and maybe Harley Quinn (Margot Robbie) , the first part of the film introduces us to all of the characters in a roll call style montage, each with their own flashback of their skill-set, arrest, and pop song. Sometimes, we are introduced to the characters twice, which didn’t make sense. Like the trailer, Ayer filmed these biographical sequences with the use of those neon color schemes and the right amount of fun and explosiveness that promised something different that took us out of the dreary, dark, and moody DC universe, but as soon as this segment was over, it was back to dark and brooding in a dilapidated city of no color or even citizens walking around. The characters themselves are all great and have their individuality, but it never goes as far as that really. Sure Deadshot (Will Smith) shows that not only is he the world’s deadliest assassin and has a chip on his shoulder in the form of Batman (Ben Affleck), but that he is willing to do anything for his 11 year old daughter, including to show her that he is not a “bad guy”. That sounds good on paper, but the execution and dialogue is covered in smelly cheese throughout and never really investigates any of this. Jay Hernandez’s character El Diablo probably has one of the better backstories, as his power is basically that of the Human Torch, but has now doesn’t use his fire power anymore, due to an accident with his family long ago. Again, this wasn’t explored as well as it should have been, and instead, we got awful dialogue and a terrible flashback that ended in that dreaded camera shot panning upwards with the character looking up at the camera, screaming, “NOOOOOOOOOOO”. Another big problem with the film was the villain, who resembled a terrible looking Zuul from ‘Ghostbusters’. The problem here is that the evil or “villain” part is never explained as to why or what it is, but is rather just thrown in there with the tired use of the sky opening up and everybody and everything being sucked up into the sky. This villain is known as The Enchantress and is basically a witch with powers who in turn has a romantic relationship with the military leader named Flag (Joel Kinnaman). This plot line is so laughable and executed so poorly, that I immediately was bored any rolling my eyes in the first part of the film. 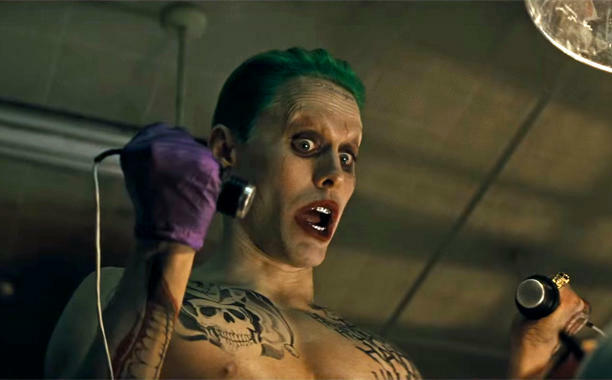 And of course there is Jared Leto’s Joker, who is only inserted here in very small doses. He’s not a major part of the film, and only serves to enhance Harley Quinn, who is easily the BEST part of the movie. Leto is fairly unpredictable and wild as the Joker should be, but he is never scary nor chaotic as he is known to be. In fact, he is mostly a weird nightclub owner in the film, but his sadistic relationship with Harley Quinn is what drives Robbie’s character, which shows us a human side to her from time to time, which brings us to Margot Robbie herself. Again, she just owns this character from top to bottom. Her inner chaos and craziness is as good as her softer human side and you can tell she just wants to be accepted in some form or fashion. I’m glad she’s getting her own film. Killer Croc’s makeup is fantastic, but is only given some throwaway jokes here and there. In fact, the film had some reshoots to make the film funnier due to the backlash on ‘Batman v Superman: Dawn of Justice‘, but it was done in such a lazy manner that you can easily tell where they added the worst and cringe worthy dialogue in to try and make it “funny”, which it wasn’t. Other characters show up out of nowhere and never have anything to do but have some special skill that is never fully utilized or sought out. ‘Suicide Squad‘ promises something good and different in its opening minutes, but then falls flat on its face and never recovers. This entry was posted on Wednesday, August 3rd, 2016 at 9:46 am	and is filed under Comics, Film, News. You can follow any responses to this entry through the RSS 2.0 feed. You can skip to the end and leave a response. Pinging is currently not allowed. « First Wave Of Programming For Fantastic Fest 2016!! !